Back in May 2011, a surprised Jessica Rabbit pin series was released. There have been a lack of Jessica pins released online, but they are still trickling out at the parks little by little. However, this series was exclusive to Disney Imagineers. You could still get them off someone on eBay - and possible trading them in parks - but Jessica Rabbit costume pins are among the most coveted. So is this series worth getting at the inflated auction prices? Read On to Find Out! I was never a fan of surprises. As of late - with Jessica Rabbit pins especially, any release seems to be a surprise. DisneyStore.com has not sold any Jessica pins since February (not including the one train set which you must be a D23 Member to buy). Disney Soda Fountain Studio Store in California has seemed to pick up some of the slack, releasing a few Jessica pins a month. That's a far cry from the deluge of pins we would have to fight for in the middle of the night each week from DisneyStore.com. Either way, the huge cut-back is Jessica pins is evident. Not a fan of surprises, I'm less a fan of ultra exclusives. So when the Jessica Rabbit Disneyland WDI (Walt Disney Imagineering) series was released - it seemed like this was yet another of those sets I would never get. Luckily, for a price, I was able to. They were originally released somewhere on Disneyland property, in a store for cast members only for $9.95 each. I paid about twice as much for each, but that seems to be the going price. I didn't know if these pins were going to be hanging around too long, so I wasn't going to take it for granted. Each pin shows Jessica Rabbit dressed from one of Disneyland's iconic characters. The first is Jessica Rabbit as The Evil Queen from the Snow White's Scary Adventure ride. The scene is from the window at the ride entrance. 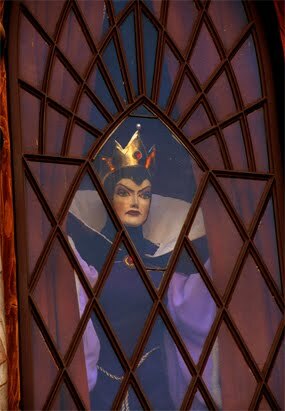 You occasionally will see The Evil Queen part the curtains and look down at you. 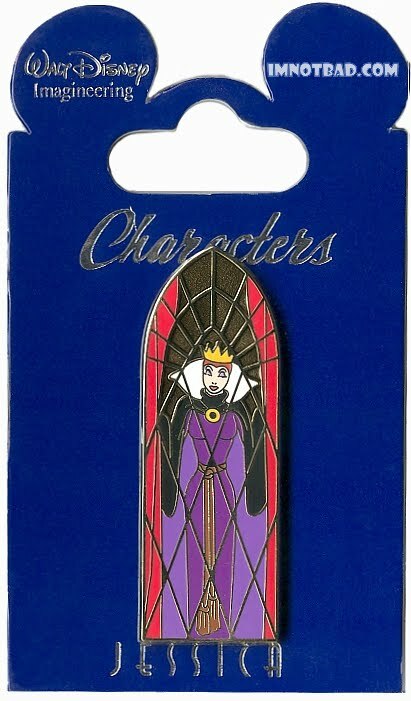 This pin is cute, but you would hardly recognize this as Jessica and not just the Queen herself. There is a special clear fill to the brown background, but the rest of the pin is the usual. The second pin was a little difficult for people to place at first. 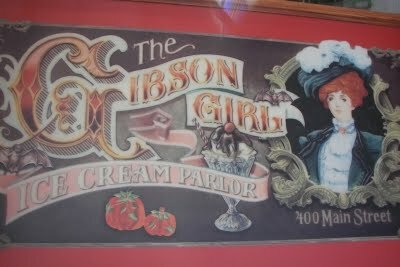 Jessica Rabbit is dressed as the Gibson Girl from the Gibson Ice Cream Parlor on Main Street. There is nothing fancy about this pin. We clearly see it's Jessica this time though, and we all see both of her eyes since they styled her hair just as the Gibson Girl's. Jessica Rabbit as The Red Head from Pirates of the Caribbean is one people have wanted to see for a long time. There was one other pin that was similar, but this is the first official time she's dressed as "Scarlett" as many call her. This pin features red glitter on her hat, top and inner dress. This is the best pin of the four, and one every Jessica fan should have. There seems to be some confusion on the last pin. It is Jessica Rabbit from the Haunted Mansion ride, but some people think she is dressed as Little Leota. I would say she is dressed as Constance, the new bride. You can see how similar they are. 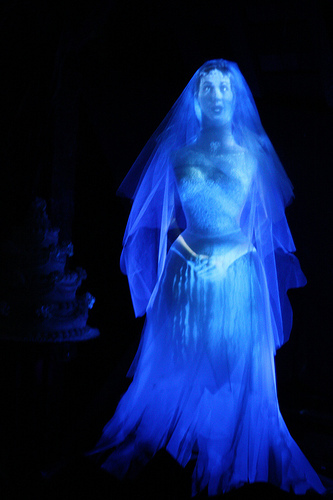 Little Leota wears her hair down and has a much different dress than Constance - so I say this is Jessica as the Haunted Mansion Bride. 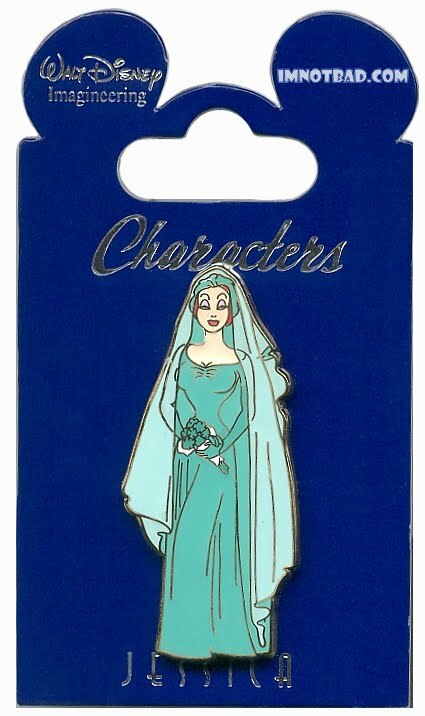 Disney updated the older bride's in both parks in the last years with the newer Constance, and it's a much better effect than the old bride - yet many people were still fond of her, too. Again, another regular pin, with no glitter or special fill. This is a little disappointing since this pin could have used that extra touch. Each card is very different than we usually see. 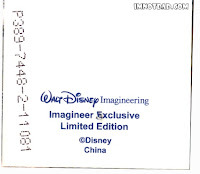 It's a dark blue cardboard, with a sliver Imagineering logo on the top ear - and also has Jessica's name imprinted in silver at the bottom. 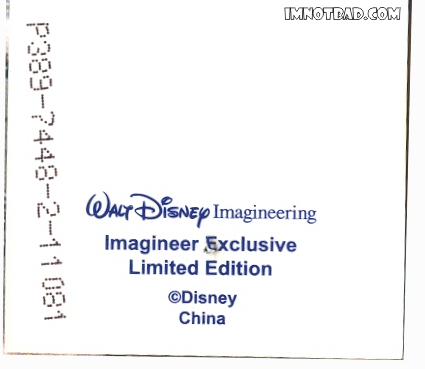 The back of the card is plain white, and also states that it is a Walt Disney Imagineer Exclusive. There is what seems to be some sort of printed code along the side of the card. Disney had started to do this in an effort to stop counterfeit pins from being sold or released, but normally would also print a matching number on the back of the pin as well. 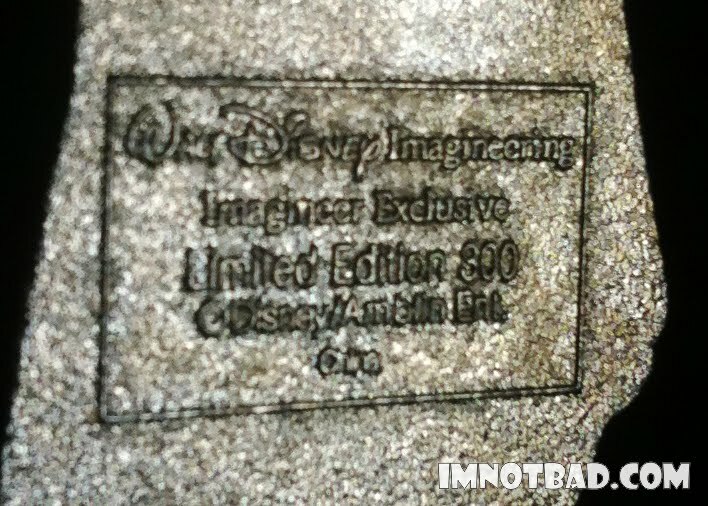 The back of the pin shows no printed code, but again shows that it's an Imagineer Exclusive, and also that it is a Limited Edition of 300. This has become a typical number for park released pins as of late. There is also the proper Disney/Amblin mark on the back too. This is a great series, and as with all Jessica Rabbit costume pins, I suspect these will be hard to come by soon. There is a very limited amount of them showing up on eBay, so there isn't much opportunity to get them. 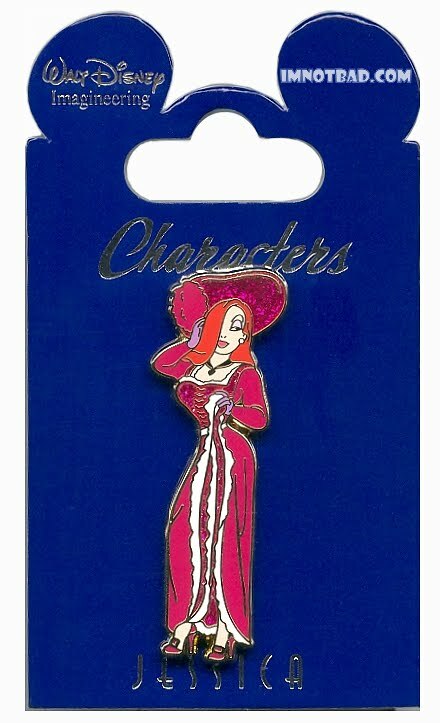 The Jessica Rabbit WDI Character Costume Pin Series gets a 4. It's a great series if you can get them all. 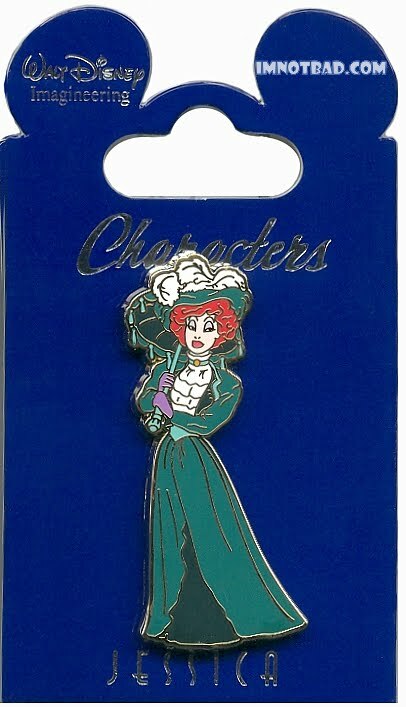 The pins are a little small, and lack a lot of flair - but with the special card and effort to make Jessica look like the actual characters makes it worth picking up - especially since they were only for Imagineers.